Our goal was twofold; First, to help establish an ongoing source of income for these women through their market sales. Second, through the efforts of these women, to provide an ongoing supply of free, natural soap to the poor with HIV and AIDS. The missionary that hosted our small group had told us that tuberculosis, which is prevalent in South Africa, can be reduced 75% by washing. Many of those with HIV and AIDS that I saw had severe skin conditions and it is my hope that the soap that these women are now producing will provide some relief to these inflicted people and help reduce the spread of TB among the sick and poor. 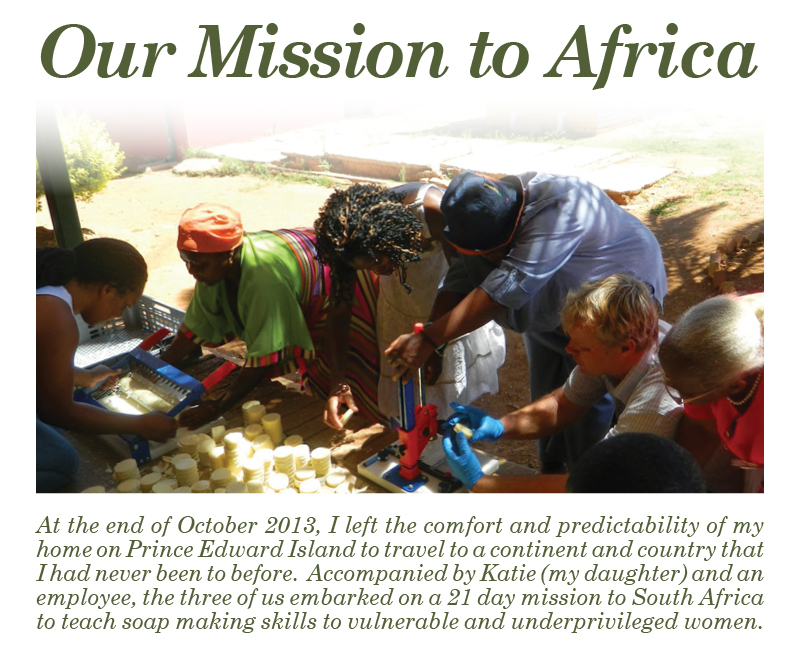 Finally, in addition to our time that we all happily gave, The Great Canadian Soap Co. financed $4,000 in travel costs and $6,000 for soap making equipment for this project. None of this would have ever been possible without the tremendous ongoing support of loyal customers like you who choose to purchase our products and refer your friends and family. It was both an honor and a privilege to have an opportunity to make this trip and for that, I sincerely thank you. Owner and Founder of The Great Canadian Soap Co.